It’s my first time doing a video in Brooklyn in nearly two weeks – ironic, given something that happened in tonight’s game. Vaughn, looking for his sixth win, has a small lead, but all three players are still technically alive. If Elliot doubles his score, he’ll have 32,000. To cover this all-in wager, Vaughn will need to wager 13,800. An incorrect response with that wager will leave Vaughn with 4,400. 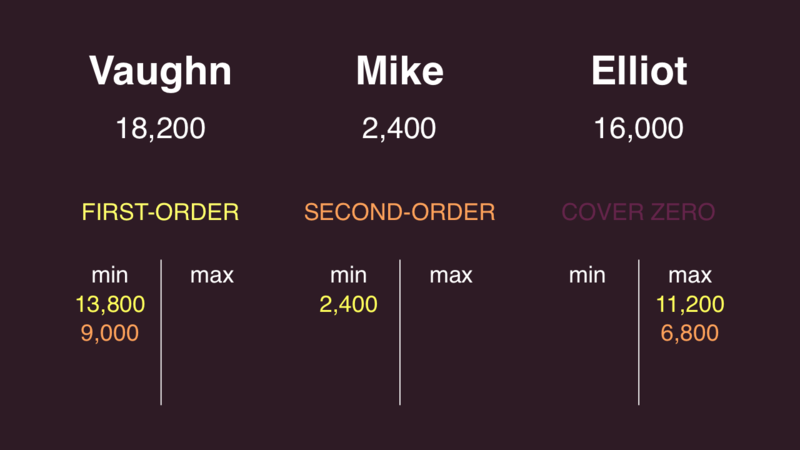 To stay above his total, Elliot can wager up to 11,600. Mike must respond correctly to have a shot, so all-in is the way to go. To stay above Mike, Elliot can wager at most 11,200. This is a Shore’s Conjecture situation; it’s the Intermediate Form. 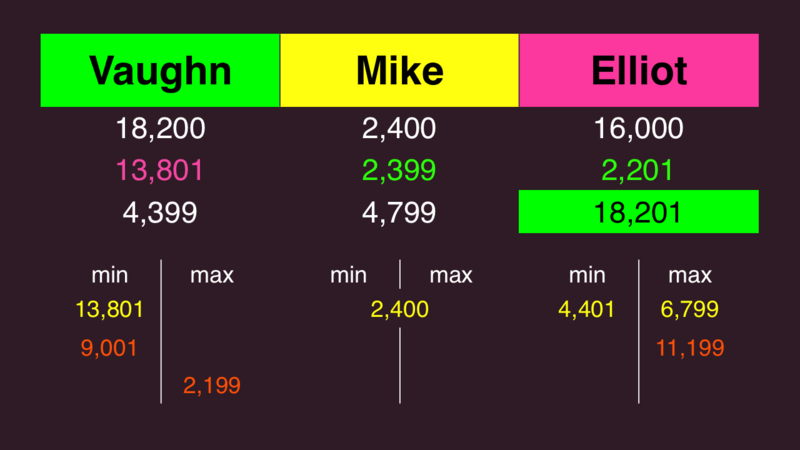 If Elliot chooses to stay above a double-up by Mike, he will have at most 27,200. Vaughn can cover that with a wager of 9,000. An incorrect response will leave Vaughn with 9,200. Elliot should cap his wager at 6,800 to account for this. 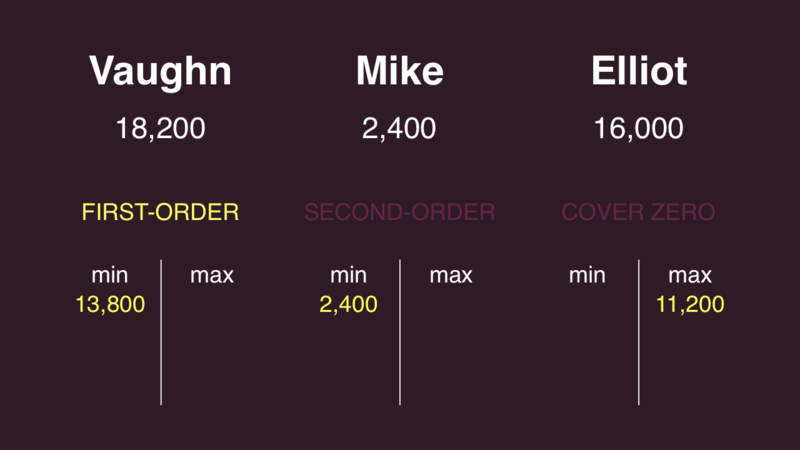 If Vaughn wants to force Elliot to respond correctly, he can cap his wager at 2,200. Elliot should wager at least 4,400 to cover an “unsafe” wager by Vaughn. Why a pink for Elliot? 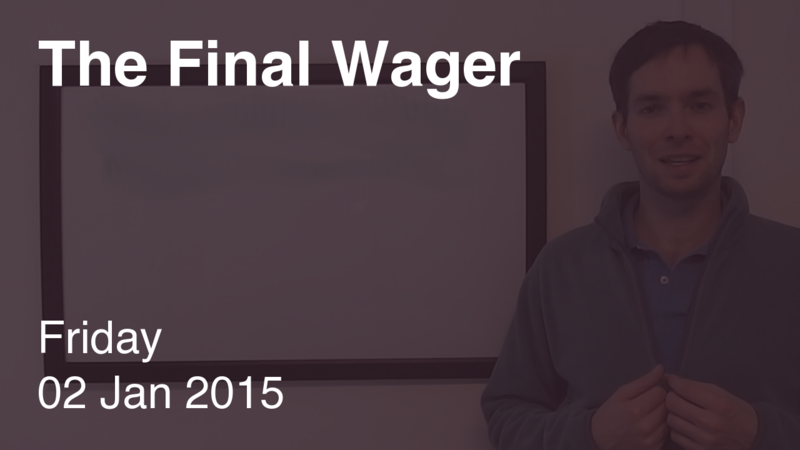 It fails to cover the rational 2,199 wager out of Vaughn, which plenty of great Jeopardy! players have attempted, including Dan Pawson in his sixth game. And what about Elliot’s reaction after discovering he had won? See my 12/23 comment for details. In the last 10 games (counting tonight) we have the following result: In 4 cases all three got it right = easy. 4 cases of 1 right + 2 cases of 2 right = 6 ok and 0 case of 0 right = hard. So that’s a “final jeopardy degree of difficulty = just right” score of 60%. Thanks for keeping track of this info, Pat – you’ve inspired me to run the data from the last 10 years to see how often we’ve been at various levels during regular play. Will share soon.